launch of a taxi initiative promoting crimestoppers unique service. From left, Ian Hamilton, targer cabs, Peter Murdoch, sbc taxi inforcement officer, Tony Broatch, sbc taxi inforcement officer, inspector John Scott, p.c. John Lennon, community beat officer, Jack Carig, chairman of lothian and borders crimestoppers and Paul Richardson, sbc community safety officer. TAXI firms in the Borders this week backed a campaign to encourage their drivers and passengers to report crime in confidence, with anonymity assured, writes Andrew Keddie. 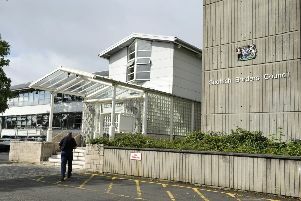 With their drivers so often at the sharp end of drunken disorder and privy to conversations in which criminality may be discussed, the private hire operators signed up to the initiative at divisional police headquarters in Hawick on Monday. From now on, cab drivers in the region will all have business cards, giving contact details for the independent charity Crimestoppers, displayed in their vehicles. “It’s part of a joint project involving the police and Scottish Borders Council, which licenses all taxis, to improve our services at a local level,” explained senior licensing officer Inspector John Scott. “We are all committed to tackling crime and antisocial behaviour and taxi drivers offer a vital service to our communities. “It is also well recognised that they see and hear a vast range of conversations and activities within our communities, some of which will be criminal activity, whether this be the transportation of drugs and actual drug dealing, or information regarding motorists who are choosing to drive while drunk. Crimestoppers operates a telephone line 0800 555 111 which people can call to pass on information completely anonymously about crimes; alternatively people can send Crimestoppers information anonymously via their website, www.crimestoppers-uk.org. Callers don’t have to give their name or any personal information and calls cannot be traced or recorded. Crimestoppers can also pay rewards if information received leads to an arrest and charge. Jack Craig, chairman of Lothian and Borders Crimestoppers, told us: “Calls to Crimestoppers are never traced or recorded and in the 24 years that the charity has been running, no-one has ever been identified. “Sometimes fear is what prevents people speaking up and we provide a completely anonymous way for members of the public to give information about criminals knowing that they won’t have to go to court or give a statement to the police”.